Abstract: The authors studied the necessity of and implementation measures for layered and categorized physical educa-tion teaching. 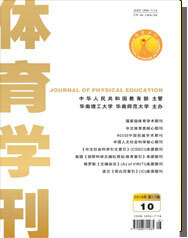 The necessity of layered and categories physical education teaching mainly embodies in the needs for physi-cal education curriculum reform, teaching quality enhancement, relative fairness of physical education, differences in physical health between individuals and groups, lifetime sports foundation establishment etc. In implementing layered and categorized teaching, there are a lot of difficulties, which mainly show in such aspects as big classes, small playgrounds, too many part-time teachers, limited classroom time etc. Effectively implementing layered and categorized teaching needs to be started with the followings: specify “layer objectives”; establish an “evaluation system”, relative “learning method guidance” and comprehensive “learning condition analysis”; choose “independent learning and training” etc.